Dyan Reaveley HEADS N TAILS Cling Stamp DYR62301 at Simon Says STAMP! DYR62301 This item is on reserve until If you would like to reserve this item now, you may purchase it now with the rest of your order. We will hold your order now and ship your entire order as soon as this item is back into stock. If you would like your order to ship now, please place this item on a separate order. Success, Dyan Reaveley HEADS N TAILS Cling Stamp DYR62301 has been shared! Fox measures approximately 3 x 3 11/16 inches, owl measures approximately 2 1/2 x 1 15/16 inches. Featuring Dyan Reaveley's signature designs, these stamps are manufactured right here in the USA by Stamper's Anonymous! 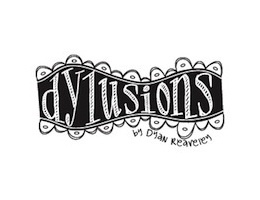 Dyan Reaveley is the creator of Dylusions by Ranger Ink including Dylusions Inks, Rubber Stamps, Stencils, Journal & Journal Block. Dyan teaches workshops worldwide in her eclectic style and owns Art from the Heart Shop & Studio.